December 14, 2010 - Iguana in Tortuguero National Park. The fauna allow close access & can be captured with a 70-200mm with an SB-800 flash. The boatman gave a bit of Tico history, how they evolved from turtle eating to logging to eco-tourism lodges, all in the last 15 years. Now tourism is the biggest contributor to the economy, turtles are a preserved species, and logging is illegal. Spider monkeys are tiny black monkeys with long forearms, longer than the legs, and a tail so strong they can hang upside down by the tails. Caimans are mean-looking smaller sort of crocs. 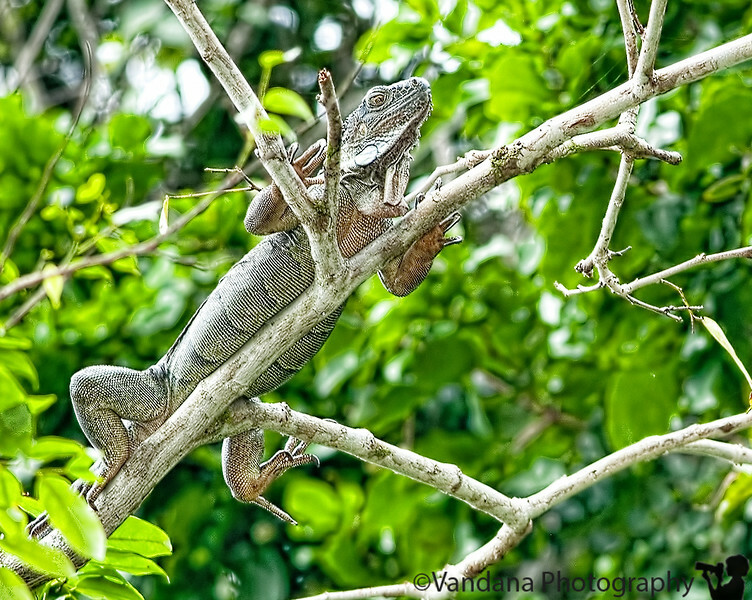 Iguanas blend in very well atop coconut trees and are hard to spot. Fantastic photo. Sounds like a fabulous trip. Wonderful capture! I'm looking forward to seeing more photos from your trip. What an incredible journey you're taking! Really neat to see this guy in his native environment!